I first heard about charity: water in 2010 when Authentic Jobs ran a campaign for their 5-year anniversary. I watched a single promo video and fell immediately in love with the program. I loved the simple, no-nonsense approach of the charity. 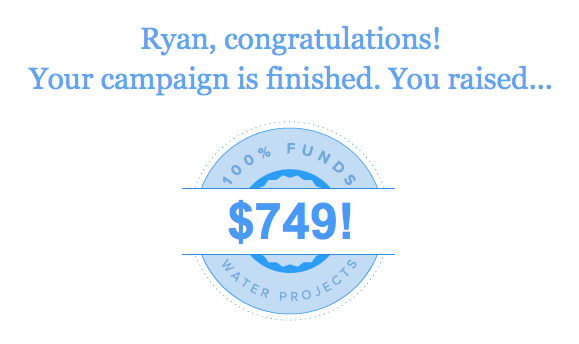 I loved that it exists solely to give people clean water. I loved that they offer proof for every dollar donated. I fell in love all over again when I got an email in mid-2012 after the project was completed. The email actually showed me where my money went. I decided right then that I’d run a campaign for my 31st birthday. Starting a campaign was actually kind of scary for me. All of the sudden I had to ask for donations. Of real money. For my birthday, sort of. From a lot people who wouldn’t ever give me a birthday gift. Thankfully, people responded and I was able to pass my very modest goal. There are an awful lot of good causes out there and it’s not possible to donate to all of them (which at times threatens to make me feel guilty), so I never expected everyone I contacted to donate. I am simply very happy with the number of people who did. When donating on charity: water you can choose to make your donation anonymous or public. I would like to thank all those who donated publicly, helping the campaign pass my goal: my wife, my parents and grandparents, my wife’s parents, my sister Jessica who then ran her own successful campaign for her birthday, Ryan Borkenhagen, Skyler & Tara Chase, Nat Harward, Du Hoang, Timothy Kavmark, Igor Lebovic, Brian Matthews, Mike Mullen (his campaign), Pierce Smith (brother-in-law), and anonymous. It takes about 18 months for the project this money is going towards to be completed. I will be posting a follow up when that happens. Thanks again to everyone who contributed, or those who wished they could have. I highly recommend doing one of these campaigns for your next birthday. If you do choose to start your own campaign, please let me know about it and I’ll do what I can to help out.